The three religions trace their origins back to Abraham, who, in Genesis, had humanity’s first relationship with God after the failures of Noah’s flood and the Tower of Babel. Judaism and Christianity trace their tie to Abraham through his son Isaac, and Islam traces it through his son Ishmael. If Abraham represents a point at which the religions diverge, they are unified up to that moment. That unity goes back to Adam, the first human being, and his creation by God. Each of the three religions reveres Adam and honors him as the first person, centering key theological elements on God’s creation of humanity through Adam. God is the father of humanity and the father of each religion. Unfortunately, the mythology of being children of the same god as father does not lead to harmonious relationships among members of the three religions. They have become squabbling children rather than a harmonious family. The Middle East, and indeed the world, continues to be rocked by political controversy, forceful oppression and violent attacks stemming from members of these three religions, both against each other and against groups within their own religion. To be fair, the religions themselves do not organize the violence and oppression. Indeed, they usually deplore it. Instead, the problems come from political or governmental authorities as well as from self-appointed (often illegal, immoral and highly violent) groups in the name of a religion. Terrorist killings and destruction, civil war and deprivation of human rights thus become identified with the names of religions -- and are regularly reported on the news. Into this difficult moment comes an exhibition of nearly 50 paintings called “The Bridge.” The paintings are by artists of Middle East origins representing all three religions. They are on display during September at the University of Wyoming Buchanan Center for the Performing Arts, at the Lander Arts Center, at Western Wyoming Community College in Rock Springs and at Northwest College in Powell. The theme of “The Bridge” is to visualize how members of the rival religious communities can cross the divide between them, moving from conflict to peace. The artists have no illusions that by themselves they will end the violence, oppression and other difficulties of the Middle East, but they hope to inspire thought and action through their visual conceptions. A different take comes from Isabelle Bakhoum, whose painting features a man walking a tightrope (quite a narrow bridge!) holding a long pole. 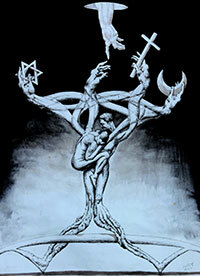 At each end are symbols for three religions. If the religions remain quiet and still, then he will keep his balance and cross successfully. If the religions move, jump about and cause the pole to jiggle, then he will find it difficult to stay balanced. What might then happen? Several paintings feature an Adam and Eve theme. My favorite is Yasser Rostrom’s “The Tree.” Here, the bridge is a branch from which grow a male and female figure. Their four arms become branches reaching upward toward the hand of God reaching down toward them (a la Michelangelo). Each of three arms holds a symbol of a monotheistic religion, while the fourth remains empty to symbolize other religions. The hands stretch out from each other, forming a polygon, yet God’s hand comes down into the middle. The painting thus suggests that on their own, they cannot reach God, but only by coming together in the center. Can they? Or, having been born from the same father, have they grown so apart that they have become permanently separate? “The Bridge’s” paintings exhibit a wide variety of styles and visions, all enjoyable to view and thought-provoking to contemplate. I encourage you to visit one of the exhibition sites and spend time with them.